Successfully Added Mini Wireless DLP Pocket Projector - 80 Lumens, 2000:1 Contrast, HDMI/MHL Input, 1080p Support, Miracst, DLNA, Airplay to your Shopping Cart. 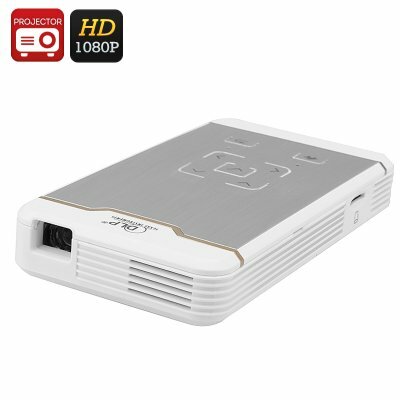 This mini pocket projector uses DLP technology, which when combined with the 80 lumens of light emitted from the three LEDs means that this projector can cast images from 10 inches to 100 inches with a throw distance to width ratio of 1.6:1. This is displayed in a native resolution of 854x480 at a 2000:1 contrast ratio. There’s no need for wires as this it supports wireless projection from your iPhone or Android Phone and this wireless projector also supports Miracast, DLNA and Airplay. With HDMI/MHL and USB inputs you can connect it to a range of games consoles, computers, set top boxes and other devices. Also as it supports memory pens and micro SD cards up to 32GB in size, you get a comprehensive amount of data inputs to cover any needs. There is a built in speaker and audio output port as well if you want to set up external speakers and with a 1.5 hour battery life you have enough power to sit back and enjoy the latest blockbusters or sporting events. With 1080p supported you can easily download great quality films and with 16:9 aspect ratio you can them enjoy them in all their glory with family and friends; all you need now is the popcorn. Projectors don't get much more portable than this. Weighing in at 147 grams and measuring only 7 by 13 by 2 centimeters, it’s hardly any bigger than your Smartphone so it can be carried around easily in your pocket, bag or briefcase where it’s always ready to entertain, educate or show your latest presentation. Whether it's the classroom, living room or boardroom, you can’t go wrong with this mini DLP pocket projector. This product is in stock now, we guarantee next working day shipping and offer a 12 months warranty on all our products. Brought to you by the leader in electronic devices as well as wholesale DLP Pocket Projectors , Chinavasion.